If you find yourself in need of any form of drive line service for your car, truck or SUV, look no further than TransMedics — North Raleigh’s premier auto shop! Funny Noises – Problems with your drive line can manifest themselves throughout your vehicle, causing a few interesting sounds to be produced. Loud clunks can be heard often when the car is being driven. You may also be able to hear a faint whir emanating at higher rates of speed. Steering Column Shakes – Rough vibrations can come from a problem with the drive shaft. The vibration can even happen on the dashboard, on the floorboards or throughout the entire vehicle. If you’re feeling heavy vibration while accelerating, bring your car in to TransMedics immediately. Problems Turning – Malfunctioning drive shafts can be even more worrisome when they impact the ability to turn your car. Does the wheel seem to fight you when you try to make sharper turns? Do you feel resistance that seems to come up from the road through the tires? Turn to our mechanics! Contact TransMedics for Work on Differentials, Driveshafts, Axles & More! 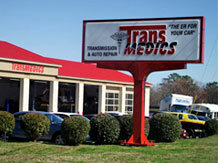 When you come to TransMedics for drive line service, you’re truly in the best of hands. Our automotive experts have been doing this for years — we’re the mechanics you can trust! To speak with a member of our team about drive lines and our additional auto maintenance and repair specialities, contact TransMedics today! We proudly serve car owners from Raleigh, Wake Forest, Rolesville, Knightdale, Durham, Cary and beyond!